Our facility is conveniently located right off Exit 5A, I-59 on Highway 3081. We’re easily accessible for residents of Pearl River and the surrounding communities. What’s there not to love about convenience? 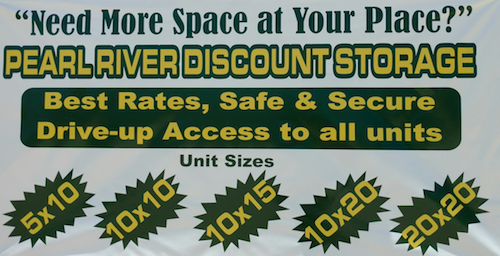 If you live in Pearl River, Slidell, Picayune, Alton, or Abita Springs, you’ll find that Pearl River Discount Storage is easily accessible for everyone in the area. We’re located just off Exit 5A, I-59 on Highway 3081, right behind Jesus Name Apostolic Church. Our facility offers a variety of storage units with affordable pricing. Contact us today to get started! To make your self storage experience as quick and convenient as possible, our facility features drive-up accessibility. That means you can park your vehicle right in front of your storage unit while you unload your belongings, which saves you plenty of time. You’ll be surprised at how quickly you’ll be done and back on the road. It’s the way self storage was meant to be. Have you recently purchased an RV? Do you have a boat or an extra car that’s taking up precious driveway space? Whatever your situation, we offer vehicle storage services to give you the extra room you need at home. Our convenient and secure parking spaces will put all of your self storage worries to rest. Call us for more information. © 2019 Pearl River Discount Storage, partners and affiliates.